34 PHOTO BY George Nagobads By HARRY THOMPSON P erhaps no man has bore witness to more important moments in USA Hockey history than Dr. V. George Nagobads. A team physician on numerous U.S. National and Olympic Teams over the span of 24 years, Nagobads has seen the best of times and the worst of times, the triumphs and the tragedies both on and off the ice. 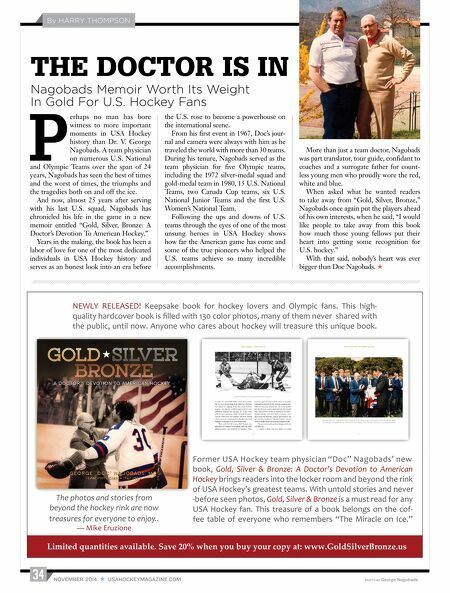 And now, almost 25 years after serving with his last U.S. squad, Nagobads has chronicled his life in the game in a new memoir entitled "Gold, Silver, Bronze: A Doctor's Devotion To American Hockey." Years in the making, the book has been a labor of love for one of the most dedicated individuals in USA Hockey history and serves as an honest look into an era before the U.S. rose to become a powerhouse on the international scene. From his first event in 1967, Doc's jour- nal and camera were always with him as he traveled the world with more than 30 teams. During his tenure, Nagobads served as the team physician for five Olympic teams, including the 1972 silver-medal squad and gold-medal team in 1980, 15 U.S. National Teams, two Canada Cup teams, six U.S. National Junior Teams and the first U.S. Women's National Team. Following the ups and downs of U.S. teams through the eyes of one of the most unsung heroes in USA Hockey shows how far the American game has come and some of the true pioneers who helped the U.S. teams achieve so many incredible accomplishments. More than just a team doctor, Nagobads was part translator, tour guide, confidant to coaches and a surrogate father for count- less young men who proudly wore the red, white and blue. When asked what he wanted readers to take away from "Gold, Silver, Bronze," Nagobads once again put the players ahead of his own interests, when he said, "I would like people to take away from this book how much those young fellows put their heart into getting some recognition for U.S. hockey." With that said, nobody's heart was ever bigger than Doc Nagobads. N Nagobads Memoir Worth Its Weight In Gold For U.S. Hockey Fans NOVEMBER. 2014 USAHOCKEYMAGAZINE.COM THE DOCTOR IS IN Former USA Hockey team physician "Doc" Nagobads' new book, Gold, Silver & Bronze: A Doctor's Devotion to American Hockey brings readers into the locker room and beyond the rink of USA Hockey's greatest teams. With untold stories and never -before seen photos, Gold, Silver & Bronze is a must read for any USA Hockey fan. This treasure of a book belongs on the cof- fee table of everyone who remembers "The Miracle on Ice." Limited quantities available. Save 20% when you buy your copy at: www.GoldSilverBronze.us The photos and stories from beyond the hockey rink are now treasures for everyone to enjoy.. — Mike Eruzione NEWLY RELEASED! 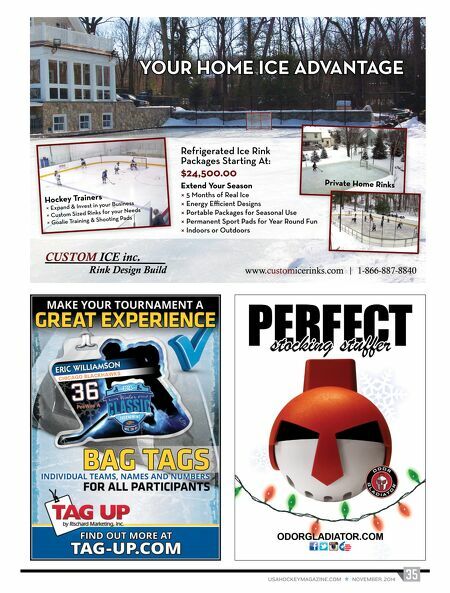 Keepsake book for hockey lovers and Olympic fans. This high- the public, until now. Anyone who cares about hockey will treasure this unique book.